The branch, located at 611 South Broadway, opened in the shopping center in 2002 and moved to the current, larger space in 2010. Elevations has been serving the Front Range since it first opened in Boulder in 1953. It has all the financial services you need: checking and savings accounts; mortgage, auto and business loans; credit cards; home equity lines of credit and more. 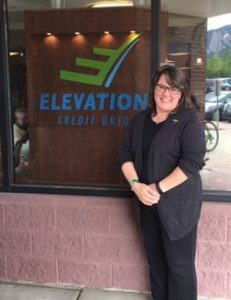 Elevations Credit Union’s focus on community allows employees paid time off to volunteer, which gives Hammell time to help two organizations important to her: Community Food Share and Boulder County AIDS Project. The company also sponsors events and educates the community with its own seminars on a range of financial topics. Year after year, Elevations Credit Union is named by the community “Best Bank/Financial Institution,” “Best Mortgage Lender” and “Best Customer Service.” It is time to check them out at the Table Mesa Shopping Center.